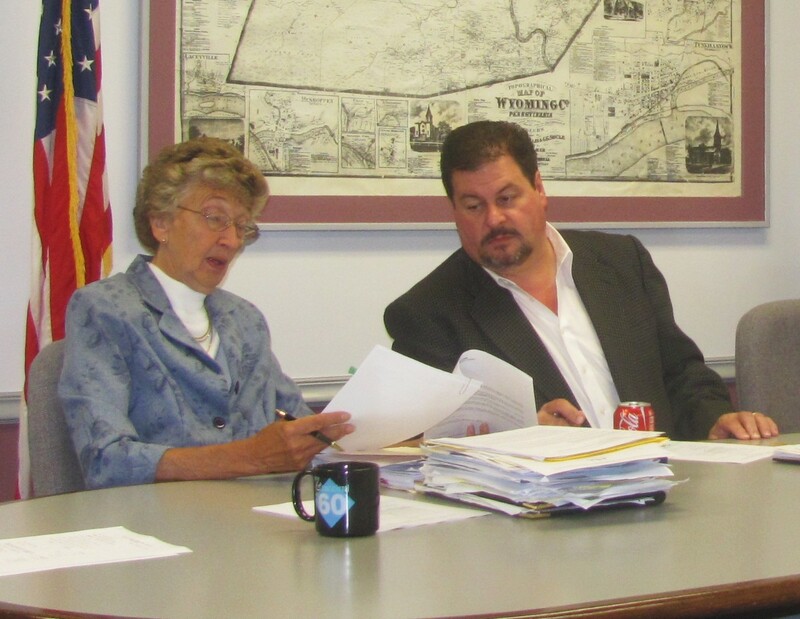 Wyoming County Commissioners Judy Mead (left) and Tom Henry prepare to sign an Emergency Management Radiation Emergency Response Fund document at a meeting held on Tuesday morning. 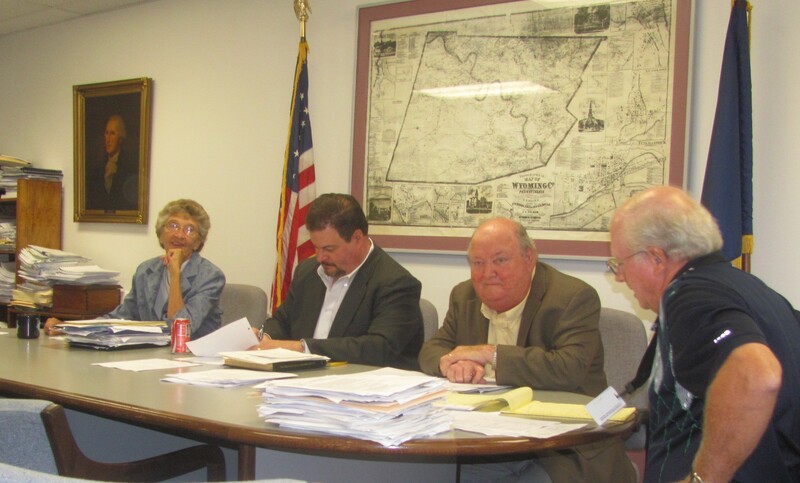 There was no public commentary at the Aug. 12 meeting of the Wyoming County Commissioners, which was probably a good thing. The agenda was already full and kept the board busy through 10 a.m. The commissioners officially ratified the transfer of the Service and Provider Agreement for Transportation Services and shared glowing commentary on the new plan brokered by Trehab that is already providing transportation for many people in need in both Wyoming and Susquehanna Counties. “It has been a smoother transition than we expected,” Commissioner Ron Williams remarked. Initially devised with senior citizens in mind, the plan has been expanded to provide rides for those who qualify for medical assistance and for residents recently released from the Wyoming County Prison to help them get back into the workforce. Many of the latter have temporarily lost their driving privileges after DUI convictions. “It feels good to get this program up and running,” said Williams, noting that the previous transportation plan “placed too many limitations on our citizens.” The county is currently renting three white vans, which have become a common site in recent weeks on area roadways. Commissioner Tom Henry noted that Interfaith has committed to covering 20 percent of eligible transportation costs for riders and asked that the agency’s name be visible on the vans. “That was a small thing to ask,” he stated in acknowledgement of Interfaith’s support of the program. Commissioner Judy Mead noted that seniors in Wyoming and Susquehanna Counties who need rides may call 866-278-9332 for more information. The preliminary approval of the Children & Youth Services (CYS) budget was moved to the beginning of the meeting to facilitate the return of CYS Director Pat Skrynski and her assistant, Marie Anderson, to their offices. A full budget will be brought in front of the board in September. Skrynski told the commissioners that the department operated well within its budget last year and will likely manage to meet expenses in the coming year with the funds that were carred over. The county will likely incur greater expenses in coming years, however, for pensions and indirect costs associated with the Nurse Family Partnership Program and Communities that Care. For at least the last five years, CYS shared grant monies with Bradford County that helped to fund those programs, but that partnership has ended. Mead related that Wyoming County started its Nurse Family program years ago with assistance from another county and then helped Bradford County set up a similar program. Bradford County went on its own this year and is no longer required to share its grant. Another grant extended solely to Wyoming County should continue to cover the costs for salaries and health care associated with the programs, Anderson noted, but the amount of that grant has not been increased in more than five years while the costs of services continue to climb. County Chief Clerk Bill Gaylord estimated that the county will be faced with an increase in CYS expenses in the neighborhood of $25,000. The commissioners signed the 2014 Community Development Block Grant Program vouchers, which included $732 in dental services for low income residents in the county. They formally accepted $4,365 in funding for the ongoing Emergency Management Radiation Emergency Response plan, which involves all counties in a radius of the Berwick nuclear power plant. Cindy Morrison and Ashley McCloud were approved as the two newest members of the Drug & Alcohol Executive Committee. They will attend monthly meetings held in Wyoming and Luzerne Counties. The commissioners signed a letter in support for the Noxen Neighborhood Association (NNA), citing the success of the organization in recent years in opening walking trails, a community park and a ball field. NNA is hoping to secure funding next to construct a building for indoor activities and to house a new food pantry. The commissioners tabled a vote on a letter supporting the distribution of PHARE (PA Housing Affordability and Rehabilitation and Enhancement) funds to the PA Housing Finance Agency. The three agreed that they were not comfortable with wording in the letter that implied a shift in priorities from a re-entry house for former inmates that would be constructed in Tunkhannock borough to the construction of townhouses in Factoryville for low income residents.